I have the power now! My election ballot just arrived! I was beginning to get a bit worried. I registered to vote via an overseas ballot with my county in New Jersey well before the deadline (and did my married name change in the process) and several weeks ago received my updated voter's registration card. But here it was, the beginning of October, and no sign of my ballot, which I was supposed to receive at least 30 days before the election. Then I saw that Vivi already got (and voted with) hers, and therefore I made up my mind that if it didn't come in today's mail, I'd call the county clerk and ask what was happening and would I be receiving the official ballot, or would I have to go with the write-in ballot, the ballot of last resort. As usual the government's doing things last-minute, but it's here in time, and that's what counts. One "Federal Overseas Official Ballot" for the General Election November 4, 2008, for Warren County, NJ. I am to vote for a President, a Senator and a Representative. Because I am no longer living in the state itself, it appears they didn't include any local referendums or local elections, which is only fair I suppose. One* official envelope which has a tear-off flap -- which I am pointedly instructed NOT to tear off! 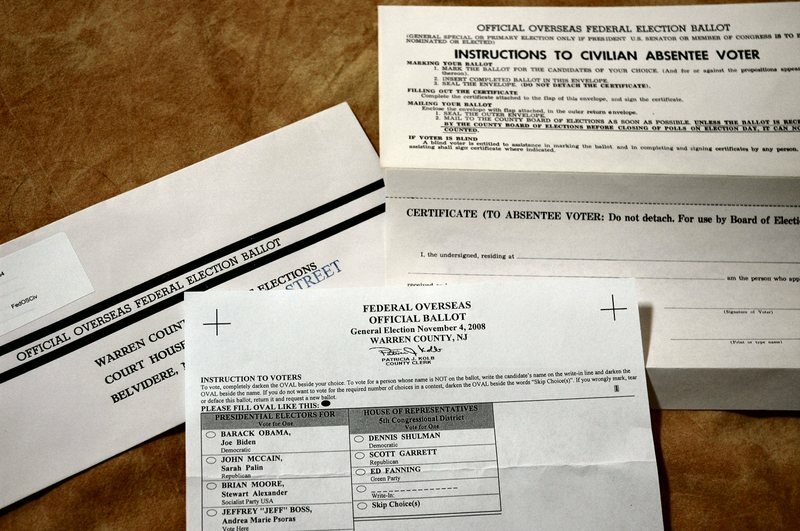 -- which I have to fill in by hand as a way of certifying that it was really me who filled out the enclosed ballot. The envelope is pre-addressed to the County Clerk's office and also contains a return address label with my name and address here in Paris. Um... so much for secret* balloting, but I guess there's no other way to do it when you're going through the post. I always like seeing the Federal ballot every four years, mainly because it's interesting to see that in America, although we are mainly a two-party system, there ARE other parties and candidates out there. This time around, there are candidates for President from the Socialist Party, a party called "Vote Here", the Green Party (which has TWO female candidates -- HEY! ), the "Socialism and Liberation" party, the "Socialist Workers" party (how those last two differ from the Socialist Party, I have no idea), the Constitution party, the Libertarians, and of course Ralph Nader managed to get himself on the ballot again as an Independent. For the Senate and House, we've got some other parties represented: "Boss for Senate", which is NOT Bruce Springsteen but some guy who's last name is Boss; "God We Trust" party; and "Poor People's Campaign" party. If you get enough signatures on a petition, you can run for office in this country, even if you don't have the millions upon millions of dollars it actually takes to run a winning campaign these days. Georges is very interested in seeing the election documents, to see how the process works for us in the U.S. When he voted in the most recent local elections in Paris, I tagged along with him to see his democracy in action and it was really a lot like how it works when you vote in person in the U.S. -- you go to a designated voting area for your neighborhood, in this case it was a primary school, you show your identification, get a ballot, go into a booth with a curtain, vote, and that's pretty much it. There are more similarities in our two countries' voting process than there are differences. Isn't that nice to know? And oh, I feel POWERFUL all of a sudden. I can't wait to put this baby in the mail and to know that no matter what the outcome, I did MY part to be the change. Now, all I will have to do after this is wait it out. It's gonna be a LONG LONG LONG month. *Turns out this method of voting is more private than I first thought. Upon closer inspection and an explanation from my very smart husband, the "instruction sheet" proved to be a special UNMARKED envelope with a tear-off flap. Plus there is the mailing envelope which has my return address on it. He explained that you put the ballot (which has no identification on it) into the inner envelope with the tear-off flap, and seal it. You write your name and address and sign the flap. Then you put THAT entire thing into the mailing envelope, post it, and off it goes. When the clerk's office receives it, they have one person open the outer envelope and put it off to the side in case maybe they need to verify receipt with it. Then another person tears off the tear-off stub and they use THAT to also verify that I sent in my ballot, to mark it in the records that I did, in fact, vote. Because you only get one vote or it's illegal, of course. Lastly, someone else will open the unmarked inner envelope, take out my unmarked ballot and tally the vote. In theory, if done properly, the people who see my name on the envelope should never know what my actual vote is, unless of course someone is peeking when he/she shouldn't be. And this all happens in advance of November 4th so they can add these long-distance votes to the ones coming in via the state voting booths. My favorite part of Georges explaining this to me was when he said that this is the way it's normally done in any good democracy. I'm not too thrilled about this $700 billion bailout being passed and rush-signed by Bush, so it was nice to have a positive reminder that I am a citizen of a democracy, however imperfect it seems to be at the present moment and however far away I may live now. My country still lets me vote. And my vote counts.